What risky driving behavior are you guilty of in the car? Try an experiment. Drive down the road today and look over to your left and your right. It’s pretty much guaranteed you will see the drivers texting, talking on a cell phone, or even eating a burger or applying lipstick. Driving distracted is an equal opportunity danger, and both sexes are guilty. When we drive distracted, we’re putting ourselves in peril, and we’re also endangering everyone else on the road. The studies show distracted driving is incredibly dangerous. But peoples’ behaviors haven’t changed. A significant majority of drivers – 87% – in a new AAA Foundation for Traffic Safety survey say they engaged in at least one “risky behavior” while behind the wheel in the past month. These risky behaviors included distracted, impaired or drowsy driving; speeding, running red lights or forgoing seat belts, according to the Feb. 25, 2016 AAA press release. Distracted driving: More than two in three drivers (70%) reported talking on a cell phone while driving. Nearly one in three drivers (31%) report doing this fairly often or regularly. Speeding: Nearly half of all drivers (48%) reported going 15 mph over the speed limit on a freeway in the past month, while 15% admit doing so fairly often or regularly. Drowsy driving: Nearly one in three drivers (32%) said they’ve driven when they were so tired they had a hard time keeping their eyes open. More than one in five (22%) admitted doing this more than once during that time. Running reds: More than one in three drivers (39%) admitted to having driven through a light that had just turned red when they could have stopped safely. About one in four drivers (26%) reported doing this more than once during that time. Seat belts: Nearly one in five drivers (18%) reported driving without a seat belt within the past 30 days, and more than one in seven (15%) admitted to doing this more than once. Drunk and impaired driving: More than one in eight motorists (13%) reported driving when their alcohol level might have been near or over the legal limit. About 9% of drivers report doing this more than once over the past year. The dangers of distracted driving are only increasing in Michigan. Its involvement in Michigan automobile accidents increased approximately 8% between 2013 and 2014 and approximately 52% between 2008 and 2014, according to Michigan Traffic Crash Facts’ “Driver Condition” data. This is consistent with my own experience as an auto accident attorney, where I see the number of defendant drivers texting and engaging in other dangerous types of distracted driving increasing my cases. Our attorneys now subpoena texting and phone records in our cases, and find people texting (and lying about the fact that they were texting after they cause a car accident) frequently. 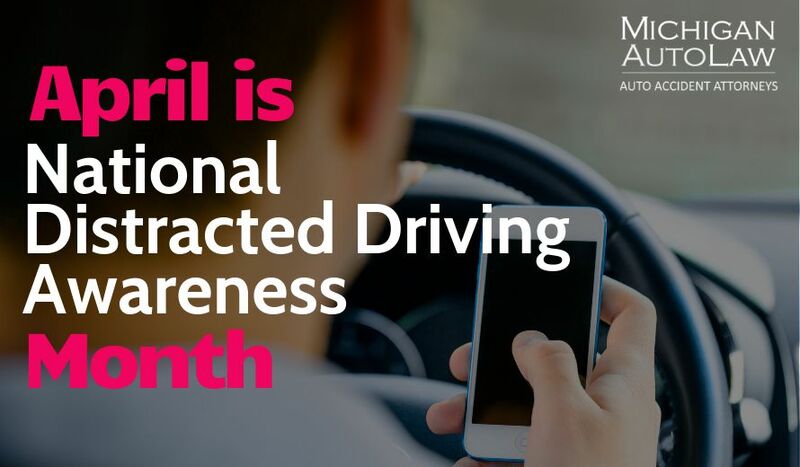 According to the NHTSA, there were over 3,331 people killed and over 387,000 people injured in motor vehicle accidents connected to distracted driving nationwide in 2011. That represents 10% of all fatal crashes and 17% of all accidents that caused injuries. Taking that further, according to the Virginia Tech Transportation Institute 2009 study, text messaging made the risk of crash or near-crash event 23.2 times as high as non-distracted driving, never mind the other distractions. So what can we do with these findings? They say that taking responsibility is the first step to positive change. If Michigan drivers are admitting they’re driving distracted, let’s take the next step and acknowledge just how dangerous and how impaired this makes us, and let’s take the next step and pledge to stop putting ourselves and everyone else on the road with us in danger here and now. Let’s stop this, protect each other on our roads, and prevent these senseless car accidents and tragic deaths. What kind of risky behavior have you engaged in behind the wheel? I used to wake up at the crack of dawn and go to the gym, and to save time and so I could get to work 10 minutes earlier, I would use an electric shaver while driving in the car on my way to the gym.